Lightly caramelized onions, goat cheese, slices of tomato, fresh basil and thyme… and if that weren’t enough, parmesan cheese on top. So indulgent, but so easy to make. It wasn’t until I studied abroad in Italy that I started to appreciate tomatoes. It was mainly because they were everywhere, and pretty much impossible to avoid. In Italy, the tomato is not a side note, sliced on a sandwich or hidden in a salad with a dozen other ingredients. It’s the main event. It’s often served with just a bit of olive oil, salt and maybe some fresh basil. 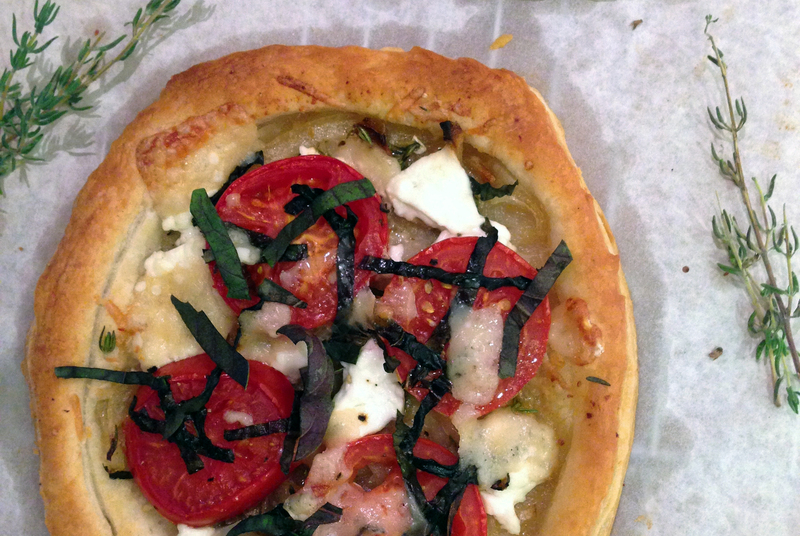 In fact, the most basic pizza – the marinara – is literally just crust with tomato sauce and basil. At the end of my year abroad, I decided to stay in Italy for the summer and do volunteer farming through WWOOF. I worked on three different farms, but my favorite was in Sicily, at the base of Mount Etna. I mostly took care of the orange trees and picked figs and almonds to sell at farmers markets, but I also worked a bit in the garden, which is where I fell in love with tomatoes. These tomatoes were the juiciest and most flavorful tomatoes I’d ever tasted, and I ate them straight from the vine, still warm from the sun. The best part (yes, it gets better!) was that the basil plants were right next to the tomato vines, so I’d pick a tomato and a basil leaf and yum, yum, yum. It was definitely a chubby soul moment. I’m still not a fan of the bland, watery, yellowish tomatoes found in many supermarkets, but when I come across the real thing, I can’t get enough. Luckily, not far from my apartment in Lisbon, there is a small organic grocery store (the kind with that wonderful, wholesome smell of ripe produce and bulk grains that welcomes you every time you walk through the door) where I can often find perfect tomatoes. 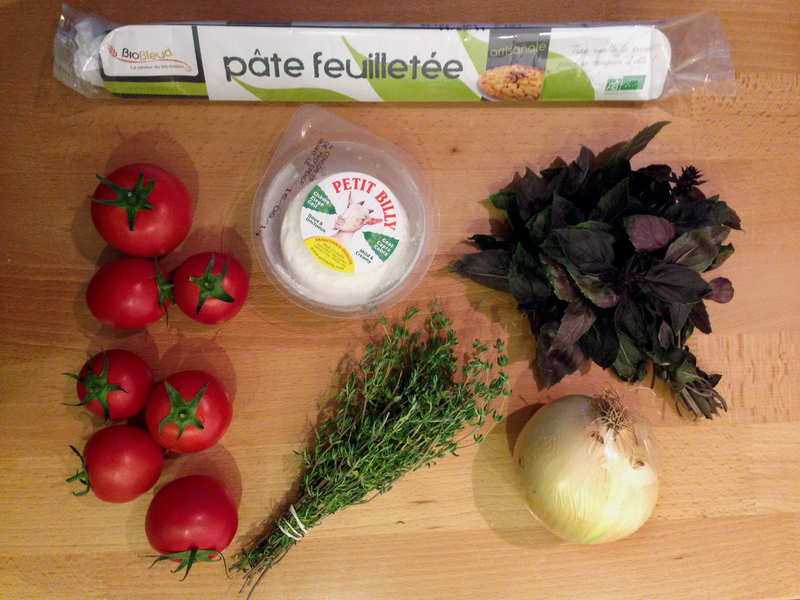 Last week they looked especially good, so I brought home a bag of them, along with a bunch of purple basil (because oh my god, the smell) and some other ingredients that I needed in order to try Barefoot Contessa’s tomato and goat cheese tart recipe. I love Ina Garten, and I’ve wanted to try this recipe for a long time but tomatoes weren’t in season and the ones I could find just didn’t seem worthy. I followed her recipe almost exactly but was extra generous with the thyme and goat cheese because, well, thyme and goat cheese are delicious. I also used plain goat cheese rather than the garlic-and-herb variety that she recommends (the recipe already calls for fresh garlic and herbs). I guess that green basil might be “prettier” than purple but as I said before, oh my god, the smell. In the end, these tarts were just amazing – light, flavorful and satisfying. In fact, the only problem was that I didn’t make enough! I halved the recipe as there are only two of us at home, but I certainly won’t make that mistake again. Preheat the oven to 425ºF/220ºC. Unroll puff pastry and cut into four six-inch circles. Discard the scraps, or come with some creative use for them! Leave the pastry circles in the fridge until you’re ready to use them. Heat olive oil in a skillet over medium-low heat and add onions and garlic. Saute until the onions are soft, about 15-20 minutes. Add salt, pepper, wine and thyme and continue to cook for another 10 minutes or so, until the wine is absorbed and the onions are lightly browned. Set aside. Use a sharp knife to score a 1/4-inch border around each pastry circle, and prick the pastry inside of the score lines with a fork. Sprinkle about a tablespoon of parmesan on each pastry, inside the scored border. Then divide the onion mixture between each circle (still within the border). Crumble goat cheese on top of the onions (be generous!) and then place slices of tomatoes on top of the cheese. Brush the tomatoes with olive oil, and sprinkle with basil and a bit more salt and pepper. Add a bit of shaved parmesan on top. Bake for 20-25 minutes until the pastry is golden brown. Serve hot. Try not to devour the tart in three bites like I did. These are meant to be savored! Also, I want to eat one (or 12) of these tarts! !